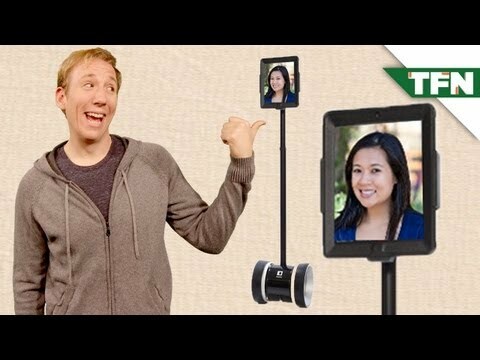 Go Anywhere Via iPad with Double Robotics! Ever wish you could send a robot to work for you? Double Robotics has created Double, a telepresence robot that lets you go to work, school, and almost anywhere you want without leaving home. Scott interviews Jay Lieu of Double Robotics Inc. at the 2013 Macworld Expo about this iPad integrated robot. Such a crap.. seems? like this is a light version of sheldonds robot !!! The Robots errr terkin errr JERRRBS!!!!? Sweet! I’ve just received my free minecraft? giftcode! This is best tech feed I’ve seen. Please? do more like this one. Send it to school, and have a pre-recorded loop of myself watching the teacher? And then somebody knocks over the robot and steals? the iPad. How much does? it cost? It’s a neat idea, but I think any office that gets one? will see it more a a novelty than something useful. I can just imagine people walking up to it from behind and turning the iPad off, also, this would only work in places that are completely flat, can’t chase the employees if they go upstairs! I’m guessing you’ve never had co-workers. If i could send a screen on wheels to be in their presence as opposed to me, I’d do it in a split second. Save the “interaction” for people I’m not forced to deal with. Also, I still don’t see how this thing is practical. You can’t do anything with it besides? look around. I’d make a self-thinking animation of myself and send it to school so I won’t have to? sit though boring history lessons even if I’m at home.